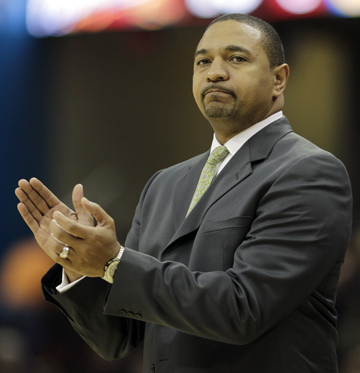 Mark Jackson isn’t making any playoff promises for the Golden State Warriors this season. Maybe it’s a lesson learned for the point guard, preacher and boisterous broadcaster turned NBA head coach. Or maybe he’s tempering expectations entering his second season considering, well, there actually are expectations with a reshaped roster built around rehabilitating center Andrew Bogut and point guard Stephen Curry. That time is almost here. With training camp beginning next week, Jackson still made it clear that not making the postseason would be a major disappointment. He also recognizes the season outlook — and perhaps his own future — hinges largely on the surgically repaired ankles of Bogut and Curry, who have had repeated problems staying on the court throughout their young careers. Same goes for Warriors fans who have long waited for a winner. For a franchise that has made the playoffs once in the last 18 years, talking about the postseason at any time might seem strange, let alone before any exhibitions have been played. Looking at the roster — on paper, anyway — it’s easy to see why the Warriors don’t find that goal so silly. The Bogut-Curry combo, if healthy, would be teamed with power forward David Lee, second-year shooting guard Klay Thompson and either Brandon Rush or seventh overall pick Harrison Barnes of North Carolina at small forward. Golden State is deeper than in recent years, too, with Jarrett Jack, Carl Landry and Richard Jefferson complementing rookies Draymond Green and Festus Ezeli, who both impressed enough during summer league and off season workouts to be considered rotation players. Jackson also has had more time to prepare this season than last, when the labor lockout eliminated most of the offseason and training camp — not to mention limiting practice time during the crammed 66-game schedule. Injuries also decimated the roster, which has been quickly reconstructed under new general manager Bob Myers, and that has Jackson more optimistic than anything after going 23-43 last season. Bogut, the 2005 No. 1 overall pick and best center the franchise has had in at least a decade, fractured his left ankle Jan. 25 with Milwaukee and sat out the rest of the season when he was acquired in a trade for guard Monta Ellis. He isn’t expected to be ready at the start of training camp Tuesday, but Jackson is hopeful Bogut will be in the starting lineup for the regular-season opener at Phoenix on Oct. 31. Injuries aside, Jackson has been pleased with the progress his team made over the summer. He said the reason he made the bold playoff prediction when he was hired last year was to “change the culture” of a losing franchise that, despite all its failures, is consistently among the NBA’s top-10 in attendance and whose fans are among the most vocal in the sports saturated Bay Area. An example of those changes Jackson points to is the noise he hears in the gym, weight room and video room at all hours. Since Labor Day, he said every player has been at Golden State's facility except beleaguered backup center Andris Biedrins, who is owed $9 million this season and has a $9 million player option for 2013-14. Jackson said he will still give the center every opportunity during training camp, although he won’t discount the effort made by others who showed up voluntarily. “I think you make a statement by being here,” Jackson said. One thing Jackson is not concerned about is his image. An ordained minister who spends his Sundays preaching at the church he and his wife own in Southern California, Jackson and his family were the targets of an extortion attempt related to an extramarital affair he had in six years ago, which became public in June. Jackson said “the process is still going forward” with the investigation. He said he never addressed the situation with his players, and didn't feel the need to, saying his moral authority as a minister or coach has not been weakened.